Elite men runners lead the field in the 121st Boston Marathon on Monday, April 17, 2017, in Hopkinton, Mass. T.K. Skenderian is the communications director for the Boston Athletic Association, which is responsible for the Boston Marathon, the world’s oldest annual marathon. Next week’s McAllen Marathon is certified by USA Track and Field and can be used as a qualifier for the Boston Marathon. Despite the Boston race’s prestige, Skenderian said the marathon is built around the runners, adding that all running events she strive to create the best possible experience for the participants. 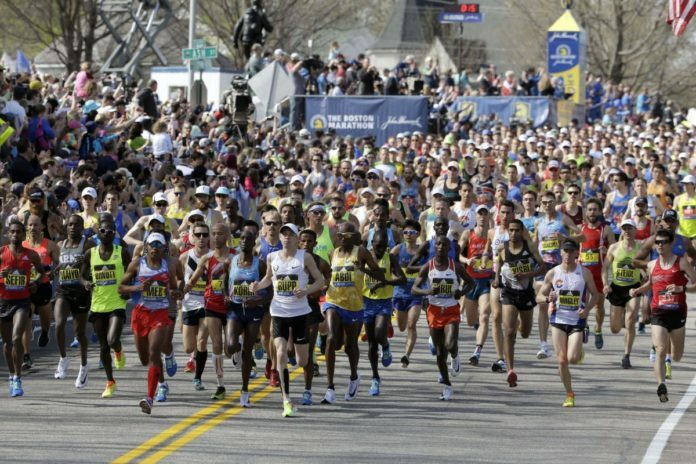 Question: How has the Boston Marathon shaped running in the United States? Answer: Running in this country, and in any country, is shaped by the runners themselves. Yes, the Boston Marathon is the oldest continually held race in the world, but without the runners who have annually taken on the challenge, it wouldn’t have held up. When the Boston Athletic Association, organizers of the race since 1897, instituted qualifying standards in the 1970s, it was meant to reduce the number of people who competed within the event. But it had the opposite effect. Runners from around the world were motivated to run even faster, and hit the qualifying standards so that they could come to Boston. The race has expanded greatly since then, and we’re proud that the qualifying standards we’ve upheld have inspired many. Once people qualify, and they make it to Boston, we hope to give them the best experience possible. After all, they did all the work. But, we believe that, we, like all races, should cater to the runners who define our sport and its future. Q: The McAllen Marathon aspires to be a popular “boutique” marathon. How would you recommend it go about doing so? A: Marathon training is often not just a commitment to the craft by the participant, but often times a sacrifice by the families of the participants as well. I think any marathon should find ways to celebrate the families in addition to the athletes. A fun spectator experience near the start and finish lines can help, as can a fun race expo, concert, or adjoining festival. For the runners, a decently flat race course, great on-course amenities, and well-organized fluid stations can really help participants enjoy themselves while competing. Beyond that, any race that has great music, motivates the community to rally around the event and the heroes within it, and takes really good care of the runners and the volunteers is usually pretty successful. Q: Most runners dream of running the Boston Marathon. What would you say to those runners? A: Training for a marathon, finishing a marathon, and qualifying for the Boston Marathon are enormous goals with months of commitment and with an inevitable need to overcome setbacks. Pursuit and attainment of these goals all start with a simple decision and a good look in the mirror. You’re stronger than you think. Q: What effect has the Boston Marathon had on the Boston community? A: I like to think that the Boston Marathon is Boston’s best weekend. Patriots’ Day is a state holiday here in Massachusetts, commemorating the start of the Revolutionary War. Schools are closed, as are many businesses, and after each grueling winter, the third Monday in April presents an unofficial beginning of spring, being outdoors, and friendly competition. The race course is largely unchanged since the first running in 1897, and among all of the spectators, volunteers, and runners, there is a sense of great ownership of the event. It’s everyone’s favorite day. The race has been through a lot. Through times of great division, economic instabilities, and world wars, the race has endured. In 1918, 100 years ago, a military relay kept the race alive as the US deepened its roots in World War 1 and reallocated its assets and manpower to support the nation. And, nearly five years ago, when the event itself was bombed, the communities which envelop this event regrouped, stood back up, and returned with an even bigger race in 2014. So while this race does have a unifying effect on the Boston community every year, it’s the Boston community (and beyond) that makes this event what it is. Q: What should McAllen focus on to make its marathon a successful community endeavor? A: A Marathon is something in which the whole community can take great pride, and organizing one is a lot of work. I think that the Kids Marathon Final Mile, and the races of shorter distances all offer community members the chance to get involved. Local businesses, churches, and other groups should all not only be aware of the race, but feel involved in some way. In Boston, in McAllen, and in most places, there are many things that divide us, but a unifying event like a Marathon can help bring us together. The race should be viewed in that way. Q: The day before the McAllen Marathon, the community hosts what it calls the McAllen Kids Marathon, a one-mile run that represents the culmination of weeks of running by kids who log their miles and run the equivalent of a marathon over several months. How important is it to get children involved in such an activity? A: This is a terrific idea and the McAllen community should be applauded for organizing it. Running brings enormous benefits to physical and mental health for people of all ages, including kids, and on a weekend where McAllen comes together to celebrate the sport of running, the future McAllen Marathoners are rightfully included. Q: Any final thoughts for the runners of the McAllen Marathon from a representative of the crown jewel of marathons: the Boston Marathon? A: When the day comes, remember that only a very small percentage of people attempt a Marathon in their lives, and just starting the race puts all runners in an “elite” category. Some runners will perform better than they had anticipated, while others won’t have their best day, but all who take on this challenge and maintained the self-discipline to get to the starting line should hold great pride in what they’ve done. Once the gun fires, relax in the early miles. Remember the good training you’ve put in to get to race day. The goal should be to try to run an easy first half, to feel good at mile 20, and to finish strong. Ideally, you want to run the second half faster than you ran the first half. And of course, enjoy it. Smile for the cameras, even if you’re hurting and you have to fake it!